12-play, 3,700-word film analysis examining Virginia Tech's defensive approach against UVA, the Cavaliers' offensive adjustments, a positive harbinger for the future, and a bonus look at backside OL technique adjustments. 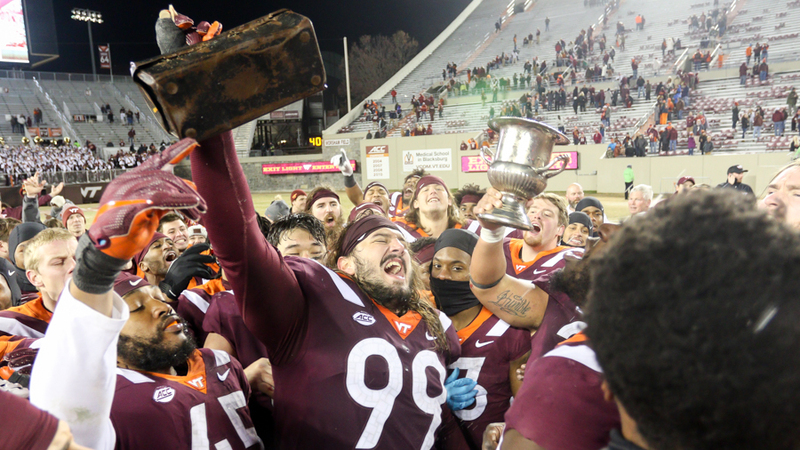 Bud Foster went old school to contain quarterback Bryce Perkins and the Virginia offense. Despite spread looks which regularly featured three wide receivers, Foster committed rover Reggie Floyd and whip Khalil Ladler to defending Perkins and the ground attack for most of the 100th edition of the Commonwealth Cup. Virginia's run game philosophy incorporates many of the same elements wishbone triple option teams used in the 70s. Running back Jordan Ellis would barrel into the line of scrimmage on a variety of dives (often using some variety of trap block by a tight end) to draw defenders inside. Perkins would then attempt to read a defensive end and get to the edge. Foster's strategy to flood the box allowed Tech's edge defenders to take away the dive, yet ensured a second-level defender (or several) accounted for Perkins. Let's examine this 2nd-and-10 run.